The Half-Life 3 trademark filing in Europe may not mean anything - but maybe it does. NeoGAF appears to be having some technical difficulties at the moment but before misfortune struck, it dug up the very interesting news that Valve has filed a trademark for "Half-Life 3" with the Trade Marks and Designs Registration Office of the European Union. The filing was made on September 29 and covers "Computer game software; Electronic game software; Downloadable computer game software via a global computer network and wireless devices; Video game software." Wow! So an official announcement of Half-Life 3 is surely just around the corner, right? Well, no. I mean, maybe, but not necessarily. 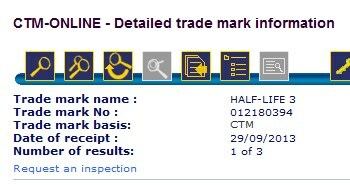 Filing a trademark in and of itself doesn't mean anything except that the party making the filing wants to hold the trademark; on the other hand, as superannuation noted on Twitter, the theory that Valve filed the mark simply to protect the name doesn't really hold water because it already has a "Half-Life" trademark. Where does that leave us? Rumor, innuendo, perhaps slightly more hopeful than yesterday and still completely in the dark. I think the great likelihood is that the wheels are turning - Valve doesn't do anything without a purpose, after all - but it's been ten years and an awful lot of disappointment since Half-Life 2. We'll update if and when we hear more but in the meantime, temper your optimism accordingly.